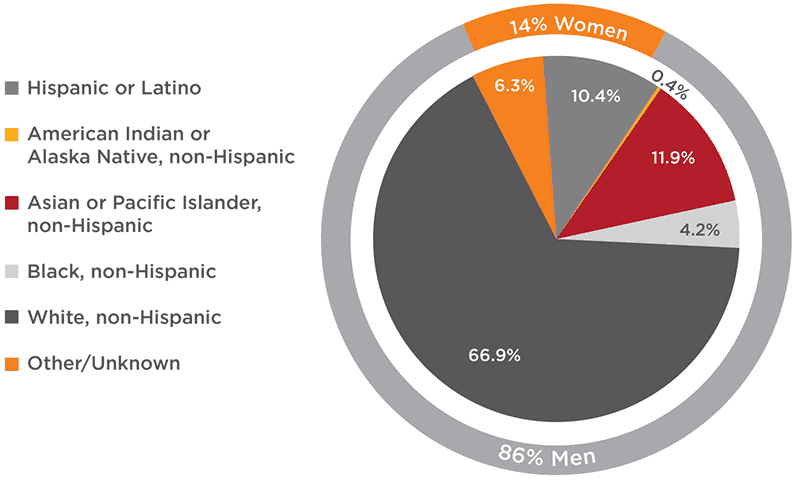 As the number of jobs requiring engineering education grows within the United States, the number of students earning degrees in those fields remains level, with women and minorities severely underrepresented. This imbalance threatens our nation's future economic competitiveness, our quality of life and our national security. The U.S. now produces about 93,000 engineers per year at the bachelor's degree level, of which only 30,000 are from underrepresented minority populations or are women. The Coalition has collaboratively created a comprehensive plan to change the public perception of engineering and encourage a diversified field of study, one that includes more women and members of other underrepresented groups. The Coalition will work to encourage these groups to pursue and succeed in engineering and technology. Toward this end, we will leverage our existing programs, networks and partnerships with institutions of higher education to achieve our common goal of producing 50,000 underrepresented minority and women engineering graduates annually by 2025. Source (Pie Chart): National Science Foundation, National Center for Science and Engineering Statistics, IPEDS Completions Survey by Race, 1977-2014, Integrated Science and Engineering Resources Data System (WebCASPAR) (https://webcaspar.nsf.gov) [04/18/16]. 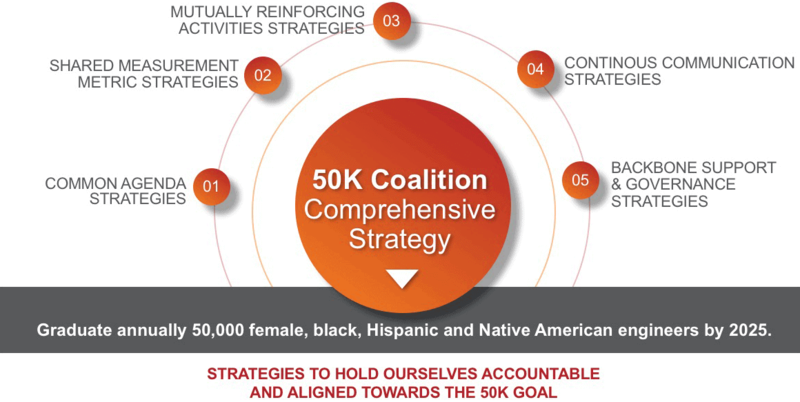 The 50K Coalition is using the Collective Impact framework to develop an evidence-based approach that drives collective action to achieve success. The Coalition works with member organizations to develop new programs and scale existing programs to reach the goal. This set of metrics focuses on the key predictors to engineering college enrollment late in the K-12 pipeline. The annual number of high school seniors who have completed AP Calculus. The annual number of high school students earning a diploma with an expressed interest in majoring in engineering. The percentage of freshmen engineering majors who return their sophomore year. The annual number of two-year college students who transfer to four-year engineering colleges. The number of Bachelor’s degrees awarded annually in engineering to US citizens and permanent residents. Increasing college and universities’ ability to recruit, enroll, retain and graduate more women and underrepresented students. Promoting the promise and outreach of engineering in creative ways that make it more appealing to underrepresented students across genders. Raising awareness and interest in engineering and proficiency with math and science early in the K-12 education pipeline. Building intentional linkages between community colleges and colleges of engineering as a critical component of the engineering graduate pipeline. Improving the climate and culture of higher education institutions and workplaces so that they are conducive and aligned to women and underrepresented students across ethnic cultures. Lowering the financial barriers to entry and completion in engineering and developing funding strategies that will sustain and scale successful activities already in place in academic institutions. Coalition partners’ program data are collected, compiled and entered into scorecards organized by Common Agenda item.